With a stay at this apartment, you'll be centrally located in Bratislava, within a 5-minute drive of New Bridge and St. Martin's Cathedral. Featured amenities include express check-in, express check-out, and an elevator (lift). Located in Zavazna Poruba, this apartment is in a national park, a 4-minute drive from Opalisko Zavazna Poruba and 11 minutes from Namestie Osloboditelov. Free self parking is available onsite. 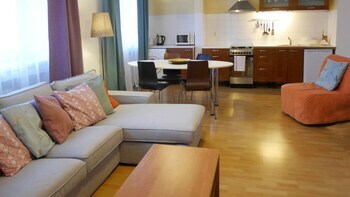 With a stay at this apartment in Bratislava, you'll be within a 10-minute drive of New Bridge and Primate's Palace. Featured amenities include luggage storage and laundry facilities. Located in Zdiar, Penzión Aja is in the mountains, within a 10-minute drive of Tatra National Park Slovakia and Bachledka Ski and Sun. Free self parking is available onsite.